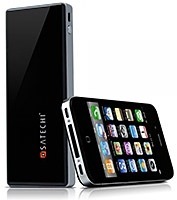 Satechi has announced that it is now shipping its Portable Energy Station for the iPhone, iPad, iPod, and other USB-charging devices. The Portable Energy Station is a compact black-and-silver 10,000 mAh battery pack offering both a 1 Amp and 2 Amp USB port, allowing for fast charging of both the iPhone and iPad, as well as the ability to charge two devices simultaneously. Other features include LED charge status indicator lights, an automatic off feature, the ability to be charged over USB or with the included AC adapter, and an included 6-in-1 charging cable. Satechi’s Portable Energy Station for the iPhone, iPad, and iPod is available now and sells for $50.